The Feline Kinetic Gastronomy movement, while growing in popularity, is still relatively unknown. Its objective is to nourish the cat’s body and spirit by combining food and art. A Feline Kinetic Gastronomy dish can be considered both a meal and a kinetic art installation, providing something to eat and something to do. Note: it’s important not to confuse Feline Kinetic Gastronomy with Canine Kinetic Gastronomy. The role of the cat is very different in the two cuisines. Flight Club is one of my cats’ favorite Feline Kinetic Gastronomy recipes. The first rule of Flight Club is: don’t talk about Flight Club. Just kidding — when prepared correctly, Flight Club is both whimsical and delicious. This dish is both slow food and fast food: slow in the sense that it starts with natural, unprocessed ingredients, and fast in the sense that it moves quickly. A word of caution, however, before we get to the actual recipe: although most of the recipes presented here will be suitable for cats in all life stages, this one isn’t. Flight Club is suitable for kittens and active adult or senior cats, but not for cats with serious health issues or mobility problems. If you’re not sure whether this recipe is right for your cat, please consult your veterinarian. 1 large enclosed space, such as the interior of a house or apartment, for presentation. 1. Prepare the space. The space should be enclosed, with no openings larger than the size of a house fly, but not sealed; make sure the space has adequate ventilation for you, your cat, and anyone else likely to be inside. If you live with your cat in a house or apartment, you can probably use your living space: just make sure your cat is inside, and then close all the doors and windows. Otherwise, you may need to buy, rent, or construct a space. While this can be expensive and/or time-consuming, I think you’ll find that it’s worth it for the seconds or even minutes of enjoyment that it provides for your cat. At the end of this step, you should have an enclosed but well-ventilated space, and you and your cat should be inside it. Note: if you choose to construct the space, you have the option of building the space first, and then placing your cat inside, or building the space around the cat. Do whatever feels right for you. 2. Allow your cat to become comfortable in the space. If this is the cat’s normal living space, you can probably skip this step. If not, this process can take anywhere from several minutes to several weeks. Please be patient. 3. Release the fly into the space. That’s it! At this point, you can sit back and relax as your cat stalks, chases, and finally eats the fly. An added bonus: when your cat is done, no cleanup will be required. If you’re participating in the Unlikely Explanations Recipe-a-Week Challenge, please post your experiences with at least one of this week’s recipes here. And if you’re not already a participant, why not join in? Simply a) acquire a cat, b) prepare one of these recipes (or last week’s recipe for Chicken with Gravy), c) feed the result to your cat, and d) post your experiences here. Or share your own Feline Kinetic Gastronomy recipes. I have an active adult cat who enjoys a good Flight Club as much as the next feline, but I was thinking of serving this al fresco now that the weather is getting nicer. Not only does it up the challenge factor for him, but he also gets an accompanying mixed greens salad this way. And then when he inevitably regurgitates the salad (as well as the Flight Club and any linger kibble), the dog then gets a tasty meal as well. Everybody wins. … and then the dog makes a further contribution, fertilizing the grass and attracting flies for additional servings of Flight Club. That’s a great example of holistic sustainability. You’re an inspiration to us all. 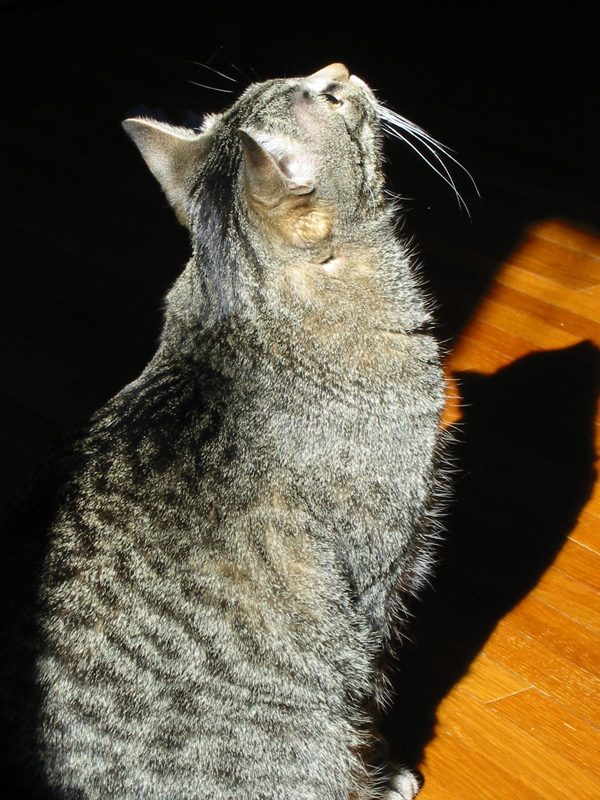 If you have a sluggish cat should you start wuth a weakened fly? A weakened fly (I keep wanting to say “weekend fly”) might not attract the cat’s attention. I would suggest using a normal fly, but a smaller space, such as the interior of a small bathroom. I wish someone would take this much effort to prepare my meals. But without the fly, of course. Hmmm. Kinetic recipes for herbivores are a little more challenging. I consulted my veterinarian about whether my cat could eat flies. He wanted to see the fly first, so I caught one and showed it to him. He said the fly was okay to eat, but after spending so much time with the fly, I became attached and couldn’t eat it. 1. Take the fly to work with you; this way, it will remain a safe distance from your cat, but you’ll still be able to spend several hours with it each day (unless you work from home, in which case you’ll need to keep the fly in the garage or possibly rent an apartment for it). 2. Find out which of the other flies is your fly’s worst enemy. Catch that fly and use it for Flight Club. The second rule of Flight Club is: don’t leave out any of the letters of “Flight Club”.